The G26 was my very first carry pistol. The second handgun I ever purchased and it started my love affair with Glock. Fast forward through four jobs, including working at a very large gun store, and its still one of my favorite handguns. I have more rounds through that handgun than any other one I own, but the Sig P365 could be the gun that changes things. Rewind to SHOT Show 2018 and the release of the Sig P365. It’s an engineering marvel with its tiny size and 10 round magazine. It is the gun people have been asking for. It seemed to have a decent trigger and while a bit pricey, it was reasonable for something coming from Sig Sauer. Fast forward a few months and I was very intrigued, BUT it was plagued with issues. I still wanted to shoot one but I wasn’t as keen on it as I had been. When I was given the opportunity by Sig Sauer to get a test gun I jumped on it. I really was looking forward to finally scratching that itch and putting the idea that Sig had made a gun I would like to bed. The moment I received the P365 I pulled the trigger to dry fire it and thought something was wrong. I checked it again, it felt like a toy gun! I thought smuggly, “Yep, just as I thought this thing is all hype.” I was wrong. Now, understand, if I had not been able to shoot this at the range my opinion would probably be different. The trigger under dry fire conditions is down right comical, but at the range this little gun is a dream. Which brings us to the question will it, or can it replace my G26. While lots of people compare the P365 to the G43, I actually think the comparison to the G26 is better. The standard round count is the same, the size is pretty close, and they are similar in weight. The Sig is definitely thinner, and the .25 pound less completely loaded certainly gives it an edge in the concealed carry department. The P365 is almost too small. It’s the first gun in this category that I really prefer having the pinky extension on the magazine. Shooting wise, the Sig ran everything flawlessly. It ran hollow points, brass cased, steel cased, sub sonics, with out a hiccup. In fact, I had some issues with light primer strikes from my G26 (which is unusual) and not a single issue from the Sig the last time I went out. The Sig Sauer P365 points very well and shoots great, and the issue with the trigger magically disappears during live fire. I wish I could explain how or why it’s different, but I can’t. I just know that during live fire, the P365 is a genuine pleasure to shoot, especially for a gun this size. While the P365 does have a shorter sight radius than the 26, the included night sights are easy to pick up and it’s very accurate. We were making hits on C-zone sized targets at 20-25 yards. The night sights also shine great in low light situations. They are certainly a step up from stock plastic sights on the G26 (Mine has upgraded Ameriglo fiber optic sights). The I have carried the Sig everyday for almost 3 months now and while it was sent to me as a demo gun, I will be buying it. It probably will not replace my G26, and the reasons are more about the modularity of the Glocks. My G26 will take all the magazines from my larger frame Glocks, and the holsters will all work. To me that is a very important thing. However, if some one asked me about the P365 vs G26 as a first concealed carry gun, I would have a hard time picking. There are a couple of points about the Sig that I don’t like. First is the price. At an MSRP of just under $600 the Sig is actually priced competitively with a new Glock 26 but, you can pick up a used G26 for much less. This should even out with time, but right now the Sig is more expensive. This leads me to my second issue and that is spare magazines. The Sig magazines are EXPENSIVE coming in at around $43. I can buy a between two and four mags for my glock at that price and depending on which ones I get they could work with my G19. Not having spare mags makes it difficult to use at the range or if you would want to take a class with the Sig. I think that Sig has done a pretty amazing job with this handgun, and while I am still not sold on many of their other handguns, this is an extremely solid option for concealed carry. 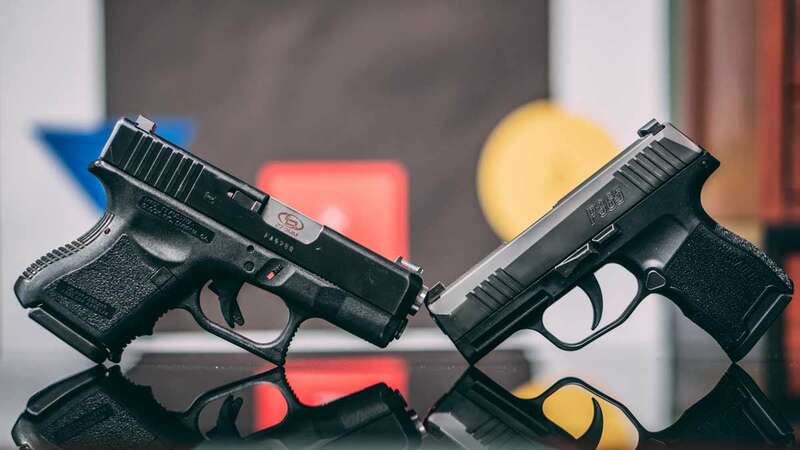 The interchangeability, and similarity of the Glock line still gives it an edge in opinion, but for anyone considering something like a Shield or a G43, I’d say you owe it to yourself to give the P365 a chance.